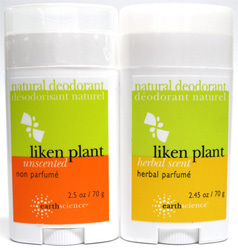 Incredibly effective deodorant with lichen plant extract - a natural cure for bacteria and odor. Aluminum free. Available in Herbal Scented or Fragrance-Free. 2.5 oz. (70g) deodorants are $5.49 each. From Haylee Bartel of Barrington, Illinois on 1/23/2018 . This product made me break out. I do have extremely sensitive skin so this might not happen often. From Anonymous of Montreal, Quebec on 1/27/2016 . I've always had trouble getting a good deodorant, and used to use Lady Speed Stick or Secret, alternating as they would stop working after 6-9 months. In the vegan varieties, I've tried several, I can't really remember them all but I think Kiss my Face, Tom's, a couple of crystal types, and Jason's. I've found Jason's and this one to work well. This one is my favourite. The scented one, that is. Unscented didn't do the job, for me. As others have said, it goes on without leaving any visible trace, it has a pleasant scent suitable for men or women, and I haven't found the need to alternate with another kind, as it doesn't seem to stop working on me. Another point would be price: at first, I found this quite expensive, especially compared to non-vegan brands, but with the non-vegan brands, I found myself having to buy a new one every month or so, whereas the Earth Science brand seems to last me about 4 months. From Kristina Ackerman of Huntington, West Virginia on 2/2/2013 . I love Earth Science products so I was eager to try this. I had bought the scented version. It smelled alright, similar to body powder. From Holli of Mount Vernon, Ohio on 7/13/2012 . Admittedly, I have always had a lot of trouble finding deodorant that works well for me. I have tried almost everything on the market and this one ranks at the bottom. It smells nice for awhile, but it has no power to repel odor. In fact, it actually seems to CAUSE odor. I am not a very stinky person, but I am very conscious of armpit odors and it is pretty bad when deodorant causes stench. From Anonymous of Avon, Ohio on 1/11/2012 . It says it is talc free but the ingredients state it has talc and silica.....? Which is it? I do like the product a lot, just wondering.